Mercy, how time flies! Here it is, nearly the end of March, 2007! The weather here in Tallahassee is gorgeous, the azaleas and dogwoods are all in bloom, and the pollen count is high! Yesterday, the temp got up to 87! And us with no rain--time to start watering the lawn & start praying for some rain! Well, it's been 3 or more months since I've put anything on the blog. Bummer! But, I've been busy (who hasn't! ), and blogging takes time. I have finished the shawl from Gathering of Lace--Beginner's Triangle. I knitted it in Elsebeth Lavold Silky Wool, on size 6 needles. Took nearly 7 balls, and the shawl has blocked out at 36 x 72 which is perfect for me. The shawl is for a class I am teaching in April for beginning lace. I think it turned out quite nice!It's still drying, but I took a photo of the detail and one of the shawl drying. Later on I will publish a finished photo. I know the one of it drying on the floor is pretty dark. Its so hard to take these pictures & have them come out for the blog sometimes. I have done several other things since I posted last time. I did a top down sweater class, and the project I completed was done in Cherry Tree Hill Oceania, which was a dream to work with and the sweater is so light you can't believe it. There is a bit of sparkly thread in the yarn, which I don't know if you'll be able to see in the photo or not. I thought it was interesting how the yarn changed patterning on the ribbed part of the sweater-neck & bottom rib. The way it swirled was really neat! I was really hoping when I saw how the yarn was behaving on the neck area that it would end up looking nice so I wouldn't have to rip it out. But overall I was happy with it & have had lots of compliments on it. By the way, if you click on any of the photos in my blog, you can see them close up. I really want you to check out the buttons on the sweater below, the Katia one. They are GREAT! Last winter I made the sweater below from one of the Katia Books. 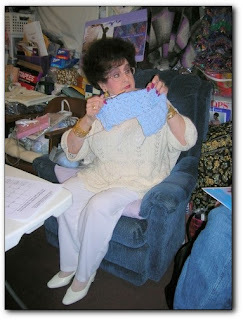 It is one of my very favorite sweaters, and I was amazed at how it all went together. The detailing of the neck was gorgeous, and so while I was wearing it this winter, I had my hubby take a picture of me in it. The buttons on the sweater could not have matched any better. I was blown away when I saw them. The last couple of things I have to show off are a cardigan in Trendsetter Dune. This year, Trendsetter came out with a solid color, and it was very hard to photograph, as it has a beautiful shiny black textured thread running through it, and it wanted to photograph silvery colored.The cardigan bottom & sleeve bottoms have a lace detail to them that really is pretty. I have 2 top down summer sweaters on needles right now, a v-neck and a Henley. They are both for the top down class I'm teaching in May. I have a short-sleeved cardigan halfway done as part of a twinset in Cascade Sierra aqua color. Still have the norweigan sweater on needles, yes the same spot it was in the photo--shame! I'm telling you this just to keep myself honest & yes, I remember I have UFO's! Sleeves are all I have left to finish on a gansey type sweater (Port Oxford pullover) done in Blackwater Abbey yarn, a heavy wool which I can't face this summer, now the temperature is already in the 80s!! I'm also dying to make a shawl out of the Victorian Lace book, already have the yarn for it--Rowan Kidsilk Haze in Wicked (black), need something to take to the symphony when we go! Guess I'm making up for lost time with this blog, huh? Hope I haven't bored you to tears so far. I have a couple more pictures and a bit more bragging to do before signing off though. 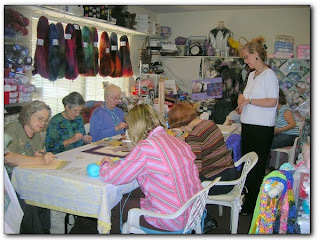 Fay's Needlecraft Boutique, where I teach classes, and one of the best yarn shops ever! !, was featured in a local newspaper about 2 months ago. The reporter came to view my class (the top down sweater class) and she interviewed both Fay & me. 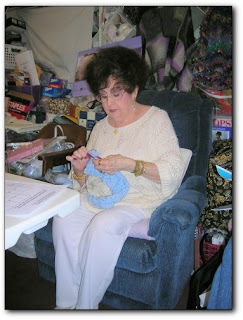 The article was very nice, and it really has helped publicize the classes & the yarn shop. The photos below are a few that came from the article. Fay is the gorgeous Liz Taylor look-alike! I am in the short-sleeved white sweater overseeing the class. You can tell from the surrounding area that Fay has alot of stuff, all the good stuff. She is one of my dearest friends.